This little village lies on the banks of the Garden River.Here you find Bath Fountain. 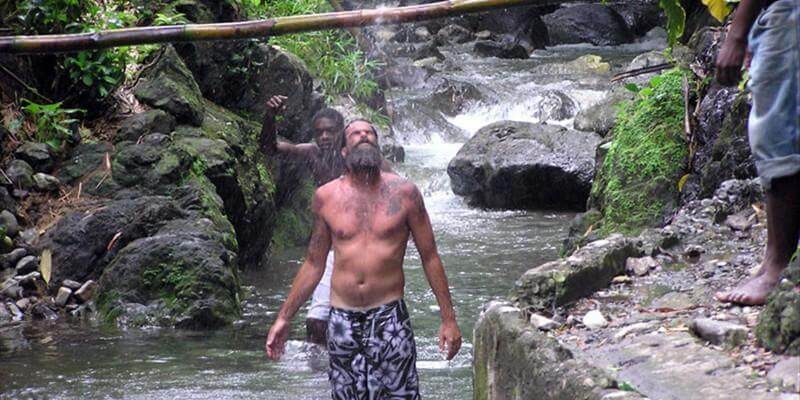 You can take a dip in the mineral hot spring water or get a hot water massage with towels from one of the many locals what hang around the natural hot bath in the river. If you prefer more privacy and quietness try one of the hot water baths inside the old original hotel, situated at the parking lot. Here you can rent your own bathroom with the same natural hot water. This is always a pleasant experience. The waters are high in lime and other minerals sulphur, magnesium, and have therapeutic value in treating skin ailments and rheumatic conditions. The drive to Bath leads us through banana estates on one side and the Blue Mountains on the other. This is a Zion Country Eco-beach Cabins half day trip. Included: all transportation. Prices on request. Entrance situated on the main road, 25 minutes drive from Zion Country Beach Cabins. This small beach is famous by the wave surfers. 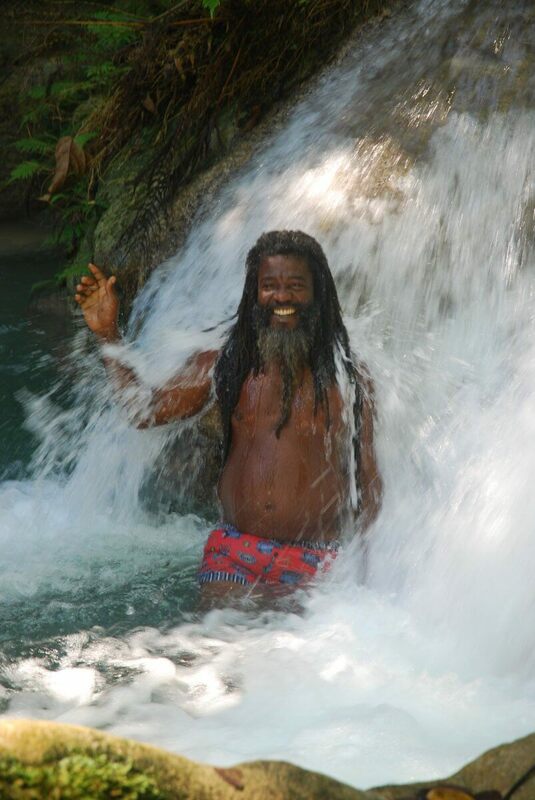 In October and November you find here in the early morning hours one of the highest waves in Jamaica. You can make you swimming with a nice combination of eating some jerk food from next door. There are drinks for sale (normal prices). Boston beach got recently refurbished and is very nice comparing and it is huge improvement. Zion Country Eco-beach Cabins offers is a 3 day/2 night trip to the Blue Mountains. Our drive takes us from Zion Country Eco-beach Cabins through Cedar Valley to the Blue Mountains. On our way we cross 2 rivers and enjoy the many beautiful views. At Hagley Gap we park our car and change to a 4-wheel drive vehicle which takes us to Whitfield Hall, a half hour drive..
Further up is cloud forest, dripping with filaments of hanging lichens and festooned with epiphytus and moss. Near the top is Stunted Dwarf or Elfin Forest, with trees such as Hirsute, Soapwood and Redwood no more than 3 m tall –an adaptation to the extreme temperatures. On return at our base, breakfast is served and the rest of the day is reserved for relaxation. 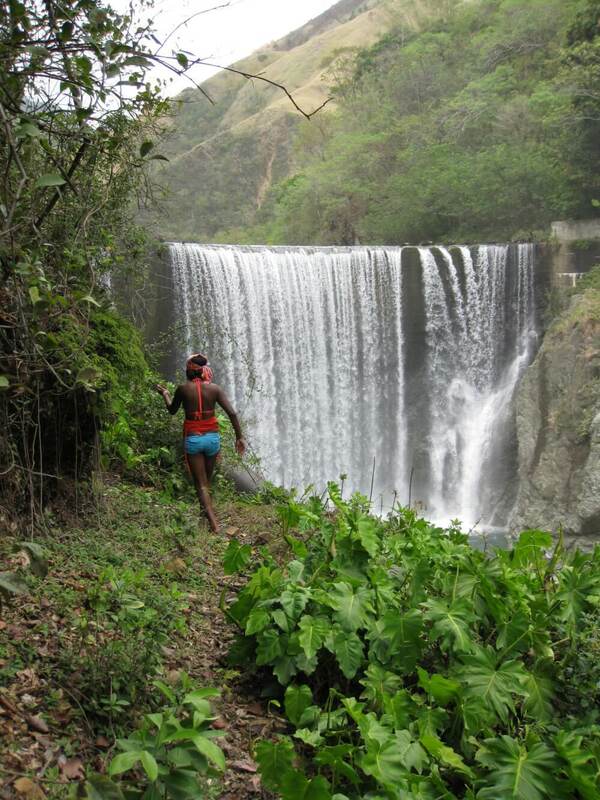 An alternative for hiking the peak, is a visit to a waterfall — a 2 hour hike.The following day you can “chill out ” or take a walk, exploring the surrounding area . On the third day we drive back to Zion Country Eco-beach Cabins. Included: All transportation and two nights accommodation. Three day trip. Prices on request. Entrance situated on the main road, 35 minutes drive from Zion Country Beach Cabins. 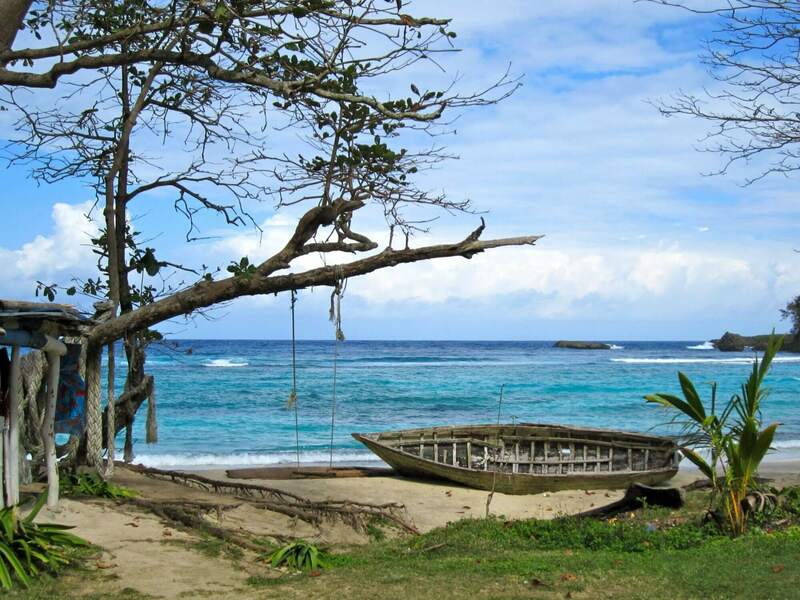 Frenchman’s cove is a nice beautiful beach what is on a small hotel property. The garden and entrance are beautifully landscaped and there is a fresh water river flowing over the property. The water is safe to swim and there is a rescue guard on duty. After swimming in the crystal clear sea water you take a dip in the river and wash off the salt. The entrance price is 9 US$. 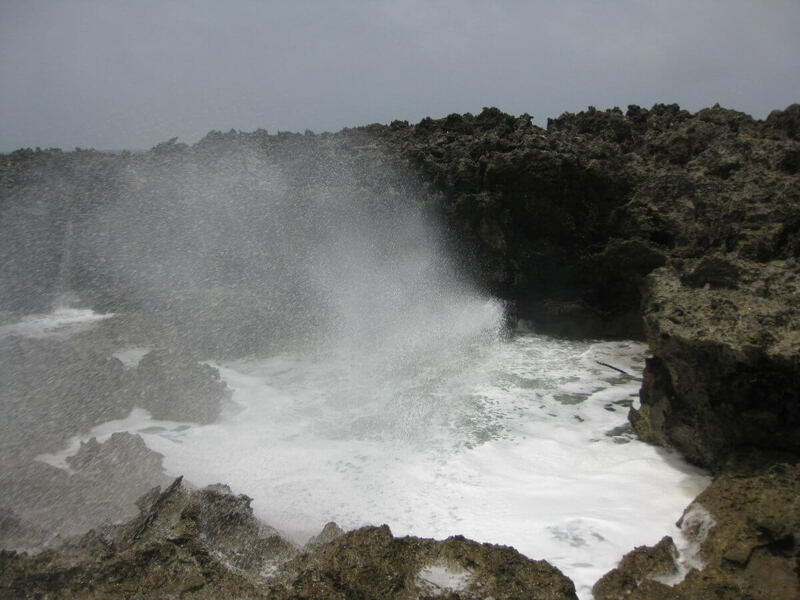 De astonishing ” Guma Guma holes ( Blow holes) are 10 minutes walk from Zion Country on the volcanic rocks. It has cracks and tunnels in the rocks and it comes somewhere out more inland by a huge hole (blow Hole) were the water get pushed up true it and is visible as Geysers, very spectacular. 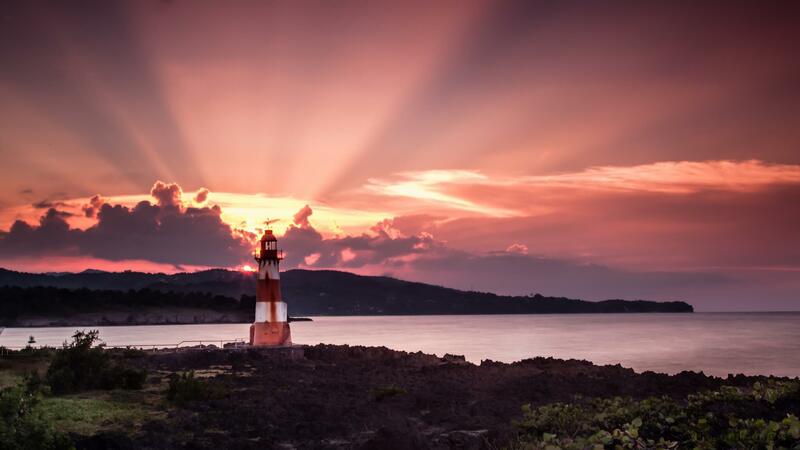 Near Morant Point Lighthouse, one of Zion Country’s regular trips, 25 minutes drive from Zion Country Beach Cabins. 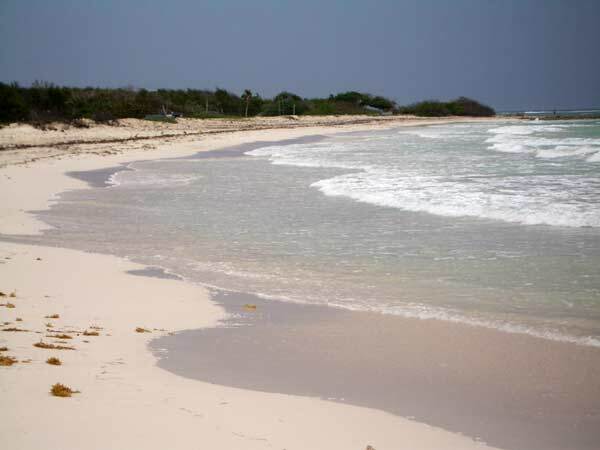 This beach is situated in the next Parish, St Thomas. 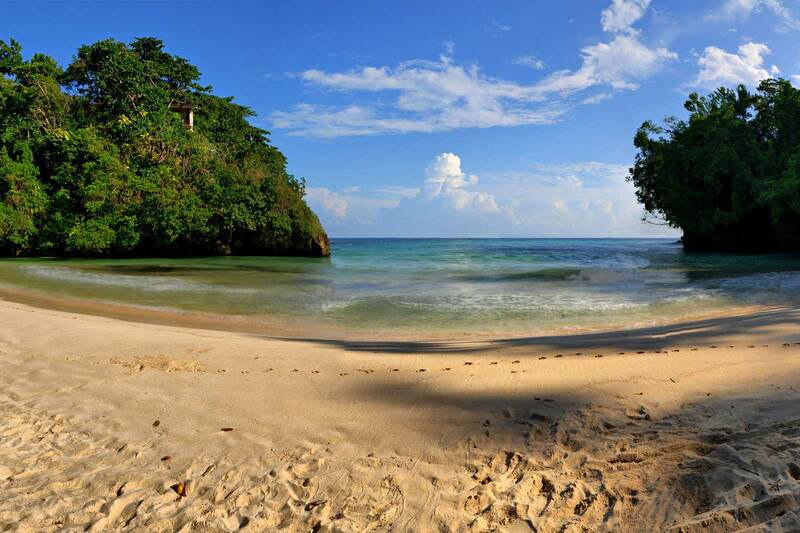 This is a hidden away beach, what is beautiful for swimming, most of the times it is you alone there. There are NO drinks or food on sale. Kingston is Jamaica’s teeming capital city. Population approx. 1 million. The city overlooks the seventh largest natural harbor in the world.With the waterfront on its Southern border, it spreads out in a fan shape from the harbor and rises gently toward the foothills and spur ridges of the Blue Mountains, nestled in a cusp. 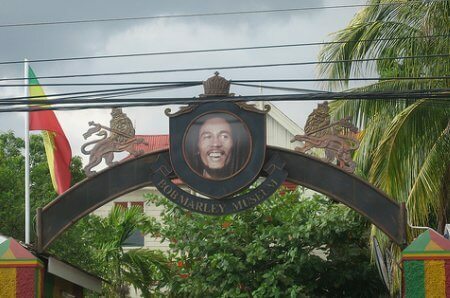 We drive you to the Bob Marley Museum where you get a tour about Bob’s musical career. (You are not allowed to wander at will, nor are cameras or tape recorders permitted). 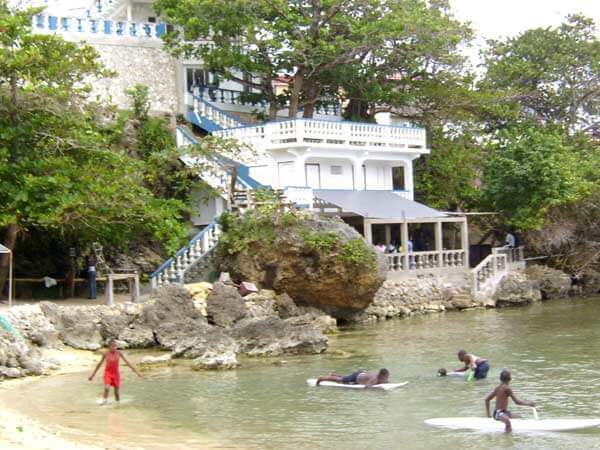 Afterwards we can visit Devon House, where you find the best ice cream in Jamaica. This is a Zion Country Eco-beach Cabins full day trip. 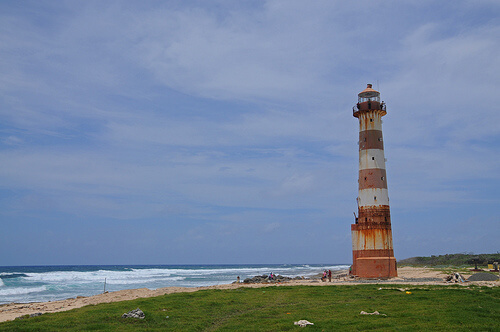 Port Royal is a dilapidated, ramshackle place of tropical lassitude. 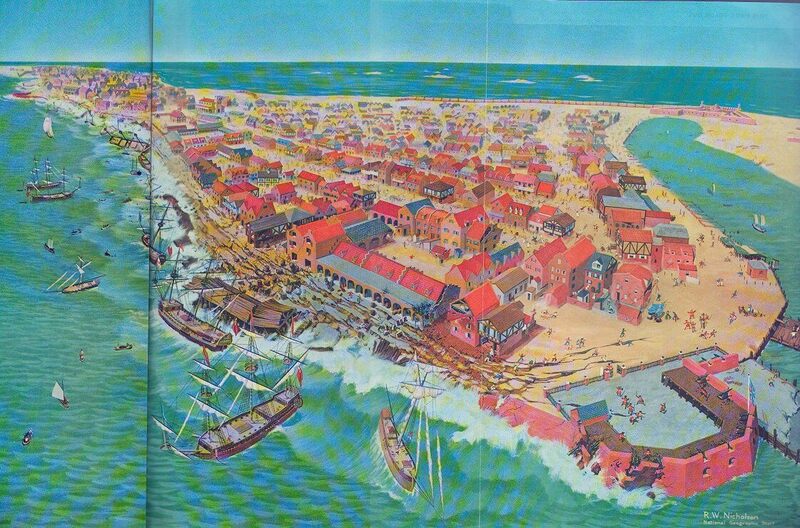 Today’s funky fishing hamlet was once the wealthiest city in the New World. In 1692 an earthquake destroyed Port Royal and 90 percent of the town disappeared under water,where it remains to this day. More than two thousand people died. Today you still find the old buildings; some of them have been rebuilt, most of them in their original shape. 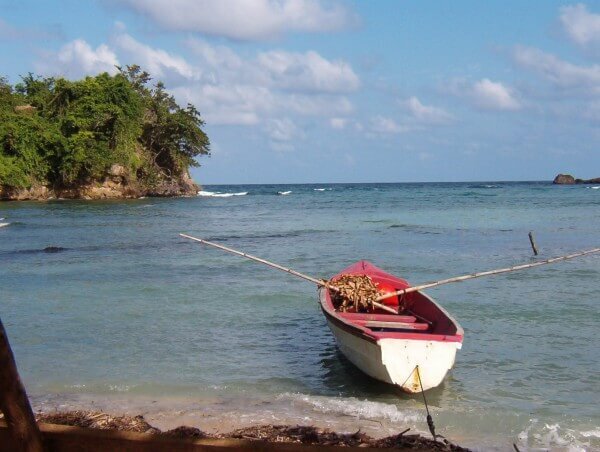 There are plans to develop Port Royal as a tourist destination. There is a famous restaurant called; Gloria’s. They serve delicious deep fright fish with Bammie (cassava bread), don’t forget to order a cold Red Stripe beer. Included:all transportation. Prices on request. the ocean at near by Holland Bay with it’s fine white sand and beautiful Caribbean-colored water. When you make the trip with Zion Country there is a small entrance fee. Included:all transportation & lighthouse fee. Prices on request. Most of the time we offer free transportation to nearby communities when sound systems are playing. We offer transportation in the evening (on request) to the following clubs in Port Antonio: Club Cristals and the Roof Club. This is a Zion Country Eco-beach Cabins trip. In the fifties and sixties many great American artists came here for holidays. One of them was Errol Flynn, who’s family once owned Navy Island. Port-Antonio has supermarkets, a completely new craft market with craft shops, a post office, a hospital, telecommunications etc. Banks are open from 9 a.m. until 2 p.m. and on Fridays until 4 p.m., closed on Saturdays and Sundays. ATM’s are also available. Folly is an old ruin dating from 1905. Once it was a two story, 70m long mansion boasting sixty rooms; an American millionaire’s humble residence. Folly now acts as popular backdrop for fashion photo shoots. East. It’s fertile alluvial soils are well watered and much of the valley is dominated by banana groves. On your raft trip you may see giant swallow tail butterflies, which are particularly abundant in early summer. Zion Country Eco-beach Cabins brings you to the starting point for your raft trip, where you pay 93 US dollars for a 1 or 2 person raft, including a captain. 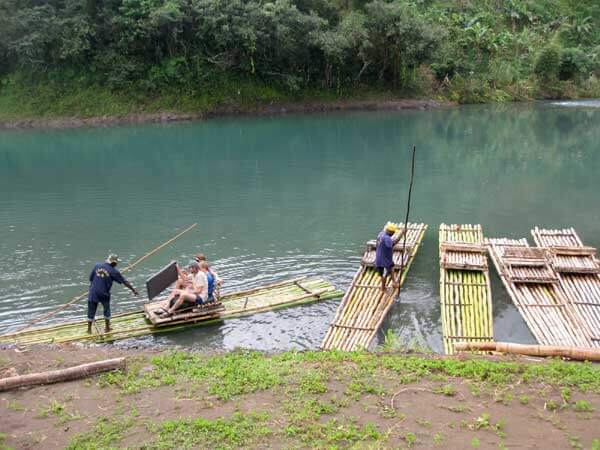 He will raft you down to sea level in about 2.5 hours, where we will pick you up again. Entrance situated on the main road, 40 minutes drive from Zion Country Beach Cabins. 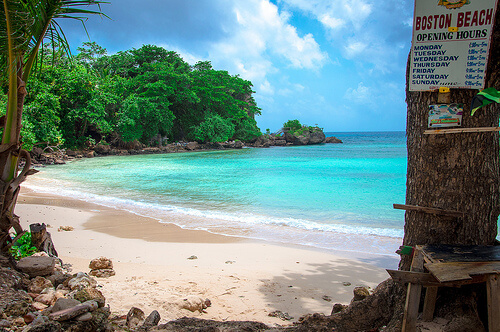 San San beach is THE beach for snorkeling. 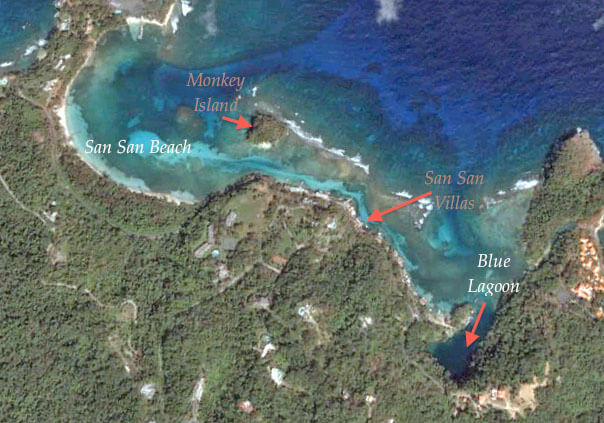 The whole marine life area around San San beach is protected by law. No fish shooting, fishing or fast boats are allowed here. This is a nice piece of marine life to explore. There are food and drinks for sale (high prices). 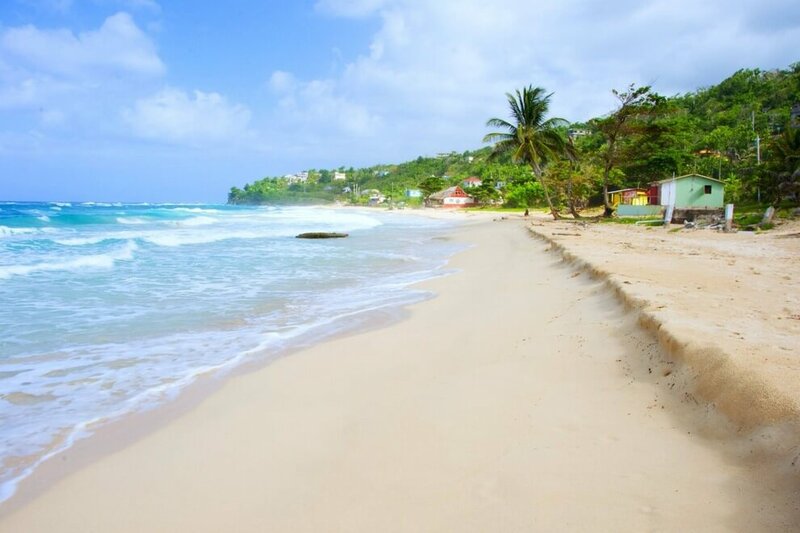 Entrance, take a right turn by reaching Jamaican Crest Hotel in Fairy Hill, right again and you follow this road till next left, follow this and it brings you finally by the beach, 25 minutes drive from Zion Country Beach Cabins. where you can take a nice swim. There are also drinks and craft on sale (normal prices).